Repairing a vintage Huret rear derailleur, I have to admit, wasn’t a job I was sure of. 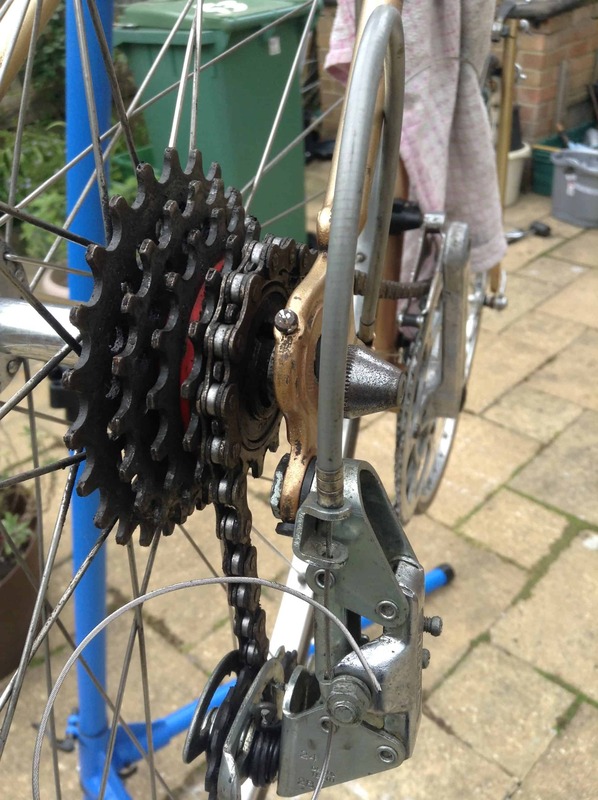 I really believed that this 1978 Huret Eco rear derailleur was broken, after taking it off an old French bike. It had no spring tension and it seemed lifeless, the jockey wheels were seized and it had basically given up doing its job. I put it in a box and didn’t think it could be repaired, or at least I thought couldn’t do the job. These derailleurs, however, are incredibly resilient, and with patience and lots of experimentation, ( including some smacks from the spring ) it’s possible to repair them. I got this derailleur working again and it’s now functioning pretty well on my bike. The Huret Eco has two threaded holes in its main body, which connects to the pulley cages which the chain wraps around. You will find a nut securing the jockey cages in one of these holes. Cleverly, Huret made two options for setting up the derailleur depending on your freewheel: a hole for a 28 tooth and one above for a 24 tooth freewheel, which is quite a cool idea for adapting to different gear ratios. 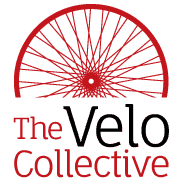 In other words, your short cage derailleur can become a medium cage one by using the other hole, essentially extending your derailleur cage length, if and when you need it. You can see in the picture that Huret stamped the two numbers, 24 and 28, on the body next to the holes. It’s quite simple to take the two sections apart; you unscrew the nut that threads onto the bolt, which connects the main body to the pulley cages, and once that is off, you just need to unscrew the bolt out with a screwdriver, as this same bolt passes though the top jockey wheel. Once you loosen it, the two parts come apart and you have access to the spring. It will most likely need a good clean, as this part of the derailleur will probably never have been accessed before. After removing some 30 year old grease, I came to the problem of the spring. I hate springs. As a rule, when a spring flies out of a part, whether it be it bike part, car part, or any other mechanical device, I consider the task of repair now a nightmare. Getting those things back in properly can cause terrible stress and hours of self-loathing. So first of all, I secured the nut back on the bolt, in the 28mm hole. As expected, things got tricky with trying to work out how to set the fiddly spring. There are three holes to choose from to attach the spring into the main body, and these holes sit close to the two threaded holes. One of them will be out of reach when you chose either the 24 or 28 hole you’re going to use. This part takes the most experimentation. I found that with the spring just sitting in either hole, there was very little tension in the derailleur. The picture above shows this, as the jockey cages are sitting loose, straight down from the main body and not sprung back. There are also two notches for the spring to sit on the upper jockey cage, giving you the further option of regulating spring tension. Unfortunately, placing the spring end on either of these notches didn’t increase spring tension. I had a feeling that this setup wouldn’t work; there just wasn’t enough tension in the derailleur, and when the chain ran through the gears, the derailleur pulleys just got pulled closer to the freewheel until there was friction between them and everything got stuck. With the derailleur on the hanger, I tried to rotate the pulley cages around the body to increase tension, but then the tension became too great and the pulley cages just jumped back to their default position, as pictured above. I also realised that by using the 28 teeth hole the distance between derailleur and my 25mm freewheel was too great. So I decided to take it apart and start again. I secured the pulley cages bolt through the 24mm hole, and then decided to try to work on the spring itself. 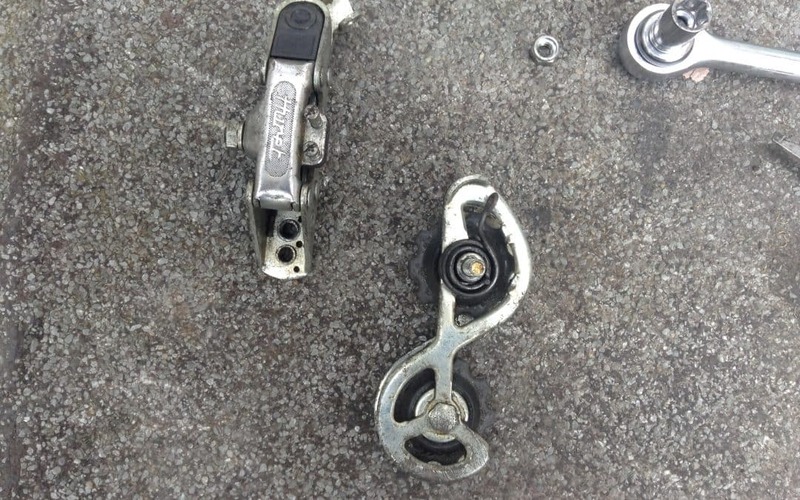 By turning the spring independently of the derailleur, trying to manipulate some tension in it myself, I could see that this is where the solution would be found for this limp derailleur. By putting tension on the spring by holding it in different positions, adding more pressure as you are going along, I found the the right setup in the end. Now, the jockey cages didn’t just sit limp as before beneath the main body ( as in picture 3 ), but rested parallel to the body, having rotated 180 degrees from the extra spring tension. 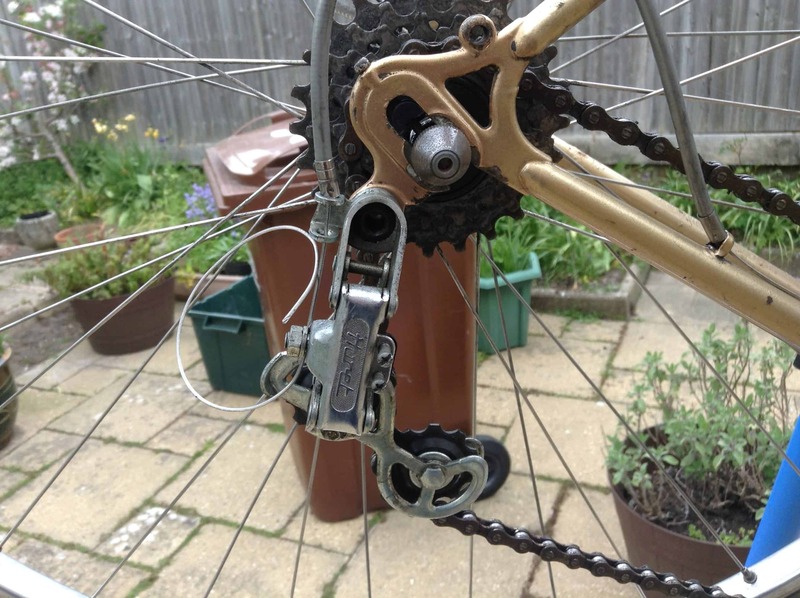 I installed the derailleur back on the bike, and hey presto, the spring did the work this time, holding the tension of the chain better and coping with all the gear ratios, from 11 to 24, from a 52/42 crankset. I don’t think it will ever be perfect, like it was when new, but it’s given the derailleur a new lease of life. You can see the difference in the shorter clearance between derailleur and freewheel. 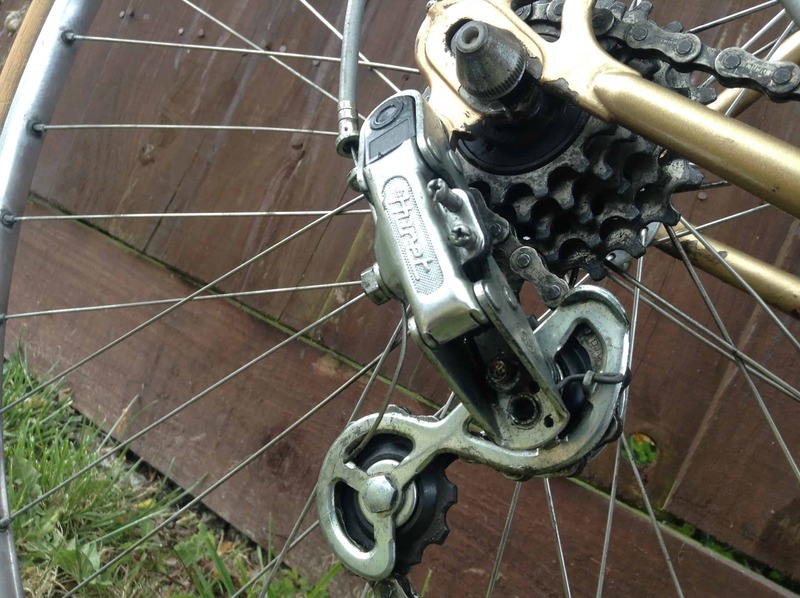 The derailleur has the classic shape of having good tension. I love the way this quality derailleur can be adapted and manipulated to fit my gear ratios, even decades later. It’s a sign of how well these derailleurs were made, and to never underestimate their abilities to come back from the dead. Hi! Can you do a video about that? I’ve the same derailleur and I’ve some problems with setting the jockey pulley (the one near the spring). There’s an allen bolt which holds the pulley to the parallelogram by the 24/28 holes, same as yours. How can I tighten that bolt in order to let the jockey spins free and to have the plate right fixed to the parallelogram at the same time? Hi, thanks for the question. What is the exact problem is it that you have? Is your jockey wheel seized? You should be able to secure the allen bolt tightly and have the jockey wheel spinning freely at the same time. Securing it to the plate does not impair the wheel’s ability to spin. The tightness of the allen bolt determines how freely the jockey wheel can move. I would tighten this only lightly so that the jockey moves freely but has no play side to side. The bolt then acts as a lock bolt and secures everything. This can be tightened down without affecting how the jockey wheel is behaving. With regard to the 24 and 28 holes, each hole offers an option of 2 spring placements and there are also 2 options for the arm of the spring on the outer part of the derailleur. I’ve chosen the tightest option for both and am getting good spring tension. Thanks for the informative comment, Andrew, it’s very helpful. Getting the right setup can be quite tricky, so cheers for the info!